Is there a more magical time of year? With chestnuts roasting, festive lights twinkling, and reindeer making the occasional early appearance, Christmas is well on its way in Cornwall. If you want to get into the festive spirit while knocking out some of your seasonal shopping, get your diary ready to pencil in some of this year’s best local Christmas markets. The Eden Project is a spectacular venue throughout the year, but it has a special atmosphere over the Christmas period. This season begins with a huge charity fundraising effort for Macmillan in the Eden Kitchen (between the two big biomes) with a range of festive stalls full of gifts, decorations, clothing, and jewellery. Sample a range of festive treats from local food producers in the Food Hall to keep up your energy levels while you browse. Tickets cost £15 for Thursday’s day fair, which includes a light lunch and admission to the Eden Project. You can purchase them here. If you prefer your winter fairs to have a little more agricultural action, join local farmers at the Royal Cornwall Events Centre on November 17 for some rural festivities. In addition to browsing craft stalls featuring locally-made food and gifts you can learn how to milk a cow, groom a pony, and watch the judging of livestock at the Wadebridge Prime Stock Show. The event is free to enter and has free onsite parking. Join us here at The Point for a festive glass of mulled wine and a mince pie while you browse our late-night shopping event. Featuring locally-made gifts from a variety of talented stall holders, we’re also offering the chance to try some of the wines from our wine list with the opportunity to purchase gift-wrapped bottles ready to put under the tree. The Bear Bar will be open for light bites and drinks from 5pm. As the home of some of Cornwall’s most celebrated chefs, a Padstow event wouldn’t be complete without an impressive culinary line-up. The eleventh anniversary of Padstow’s first Christmas Festival will include cooking demonstrations from more than 60 chefs, including local foodies Rick Stein, Paul Ainsworth, and Nathan Outlaw. With a range of stalls selling locally produced food, drink, and arts and crafts, and the Santa Fun Run & Cycle returning on Sat 8th December, this year’s event promises to be just as festive as ever. 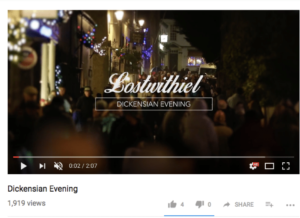 Get your top hat and tails ready and step back into the 19th century for Lostwithiel’s ever-popular Dickensian Evening. Festive entertainment includes a lantern parade, traditional Santa’s grotto, carol singing, and Advent Window Trail, and gift stalls can be found in the Church Rooms and Drill Hall for some authentic seasonal shopping. Fancy dress is highly encouraged! If you’re looking for somewhere to stay during the festive period, The Point offers an excellent variety of self-catering holiday accommodation. To book your cosy winter getaway or find out more about our leisure facilities, contact us today.